National Credit And Commerce Bank Limited (NCCBL) was incorporated in Bangladesh as a banking company under the companies Act 1994. The principal place of business is the registered office at 7-8 Motijheel Commercial Area, Dhaka 1000. It has 53 branches all over Bangladesh at 31 December 2007. It carries out all banking activities through its branches in Bangladesh. The bank is listed with Dhaka stock exchange limited and Chittagong stock exchange limited as a publicly quoted company for its shares. The bank commenced its banking business with sixteen branches from May 17, 1993. Despite volatile economic atmosphere of the country, the bank performed well in respect of deposit mobilization and profit earning during the year under review. The bank was able to harvest the result of its efforts to enhancing quality of assets and recovery of dues from default borrowers. The year 2007 was another milestone of success for the bank in terms of earning profit and consolidating position at various spheres of operations. The bank followed cautious policy during the year in the face of prevailing turbulent atmosphere of the country. The profit figure at the end of the year stood at Tk.178.02 crore recording an increase of 40.16% over the previous year’s figure of Tk.127.01 crore. The bank has given due emphasis on increasing fee-based and off-balance sheet income during the year which helped increasing total income and thereby profitability. The paid-up capital has increased to Tk.1, 352.01 million against Tk. 1,201.79 million of 2006 and reserve fund has also increased to Tk.1,995.36 million registering 64.15% increased over last year’s Tk.1,215.58 million. The capital adequacy remained at 10.61% as against 9.78% of previous year. Under credit declared credit policy the bank operates through a number of conventional and various credit schemes including small business loan, Housing loan, and Festival loan which help playing effectively in the market and ensures steady earnings for the bank. Bank’s leasing unit and syndicated loans have also contributed to the income during the year as before. Our agri-credit scheme sustained its viability by contributing to the profitability. During the year total Advance stood at Tk. 32,687.75 million. 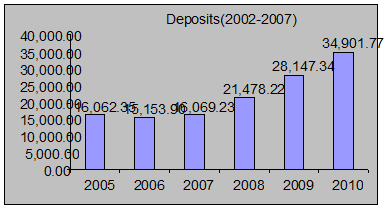 Advance/deposit ratio was 93.66% in 2007. Investment figure of the bank as on 31st December, 2007 stood at Tk. 6,266.62 million as against Tk. 3,552.08 million of the previous year. Considering the good rate of return, the bank emphasized on making investment in Govt. Treasury bill with a view to utilizing its liquid fund on temporary basis so that the same can be liquidate to meet urgent requirements. Bank largely depends in its foreign exchange business to ensure profitability. To look after the business and also to ensure prompt service to the Import & export, officers having exposure and expertise in foreign exchange business have been posted both at head office & authorized dealer branches. During 2007, the bank handled export & import business to the tune of Tk. 9,577.92 million & Tk. 28,779.21 million respectively. Bank’s wide network of correspondence plays vital role in facilitating its International trading. At present, total number of correspondents is 398. Through effective fund management, the bank could earn Tk. 28,260 million during the year through dealing room operation. The operational profit of the bank during 2007 was TK.1, 780.24 million as against TK.1, 267.57 million in 2006, rate of growth being 40.17%. Return on Assets (ROA) was 1.59. During the year the bank opened 07 (Seven) Branches which raised the total number of branches to 53 and it will also be expanded to open 04(four) more new Branches in 2008.The number of Executives & Officers as on 31.12.2007 was 956 against 847 on 31.122006.The board of directors has been pleased to recommend 30% Bonus share (stock dividend) for its valued shareholders for the year 2007. By calculating all the ratio analysis and CAMEL rating we can say that the NCC bank is in good positions. The Jews in Jerusalem introduced a kind of banking in the form of money lending before the birth of Christ. The word ‘Bank’ was probably derived from the word ‘Bench’ as during ancient time Jews used to do money-lending business sitting on long benches. First modern banking was introduced in 1668 in Stockholm as ‘Svingss Pis Bank’ which opened up a new ear of banking, activates through out the European Mainland. In the North Asia region the Afgan traders popularly known as kabuliwallas introduced early banking system. Muslim businessman from Kabul, Afghanistan came to India & started money-lending business in exchange of interest sometime in 1312 A. D. They were known as ‘Kabuliwallas’. Banks are now beyond those old concepts. Now Bank represents a significant & influential sector of business world wide. Most individuals and origination make use of the Banks, either as depositors or borrowers. Bank play a major rule in maintaining confidence in the monetary system through their close relationship with regulatory authorities and governments regulations imposed on them by those governments. In modern economy banking system is very important. Now a day we can not think without banking system. Banks contribute as a financial intermediary. It takes deposit from surplus sources and gives on crisis sectors. In order to develop a better economic system, bank’s role is very necessary. In order to meet this need in our country many banks have been established. A lot of private and govt. banks are available in our country. To meet financial crisis international banks are interested to come in our country. Middle class people’s volume is the largest in our country. They would like to increase their standard of living. For this reason convenient goods are needed for their daily life. But it is very difficult to buy for middle class people or fixed income group. They can not collect a large amount of money at a time. In order to meet this problem a modern credit concept has been emerged in our country. The name of this credit concept is ‘consumer’s credit scheme’. It is a sophisticated credit scheme which has emerged maximum banks of our country. It is also a popular scheme all over the world. The report fulfills and imperative requirement of the course. During the 3-month internship program, students are assigned to an organization to observe a practical application or the theoretical knowledge. At last, a report with proper analysis and possible solution of the problematic zone of the organization needs to be submitted. Human beings habit is to consume more and more commodity. People who are middle class income group or fixed income group always wants to consume sophisticated commodity. People who earn a lot of that means who is engaged with business, doctor, Lower etc. are earning a lot of and consuming. But it is a critical problem for fixed income group. They can not manage a lot of money at a time. At present a lot of technological commodities are available at market. This middle class people are very much interested to buy those commodities. Because none can avoid the need of consumer and shopping goods such as television, radio, fan, CD player, refrigerator, car, apartment etc. Even people are very interested to buy computer. Day by day all of these commodities are becoming as core need of human beings. In order to support this fixed income group a concept of banking ‘consumer credit scheme’ in emerged and has got popular acceptance the across the world. Because taking loan under this scheme people of middle income group are able to satisfy their need. Different banks of our country have launched this scheme. 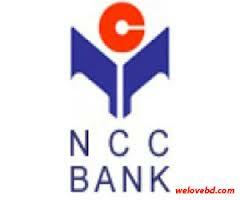 NCC Bank Ltd. is a popular bank in our country. This bank promoted the scheme to uphold the living status of fixed income group people. But it is also a critical need to satisfy the effectiveness of the consumer’s credit scheme on the perspective of Bangladesh. In the MBA programmed the department of marketing, University of Rajshahi has been fostered a practice of ‘internship’ work. In last semester of MBA program students are bounded to complete this study. As I am a student of MBA program it is better opportunity for me to drive study on this topic. At last I would like to say that it is a very important study for MBA program. It would play an important role on practical life. To know the history of the National Credit and Commerce (NCC) Bank Limited. To know about the overall general banking system of NCC Bank Limited. To understand the major banking activities a banker performs those. To highlight the bank accounting system as different manuals and from practical and from practical orientation. To find accounting standards appropriate and applicable in the bank accounting system. To know about present possession of National Credit and Commerce Bank limited in competitive market. To study existing bankers customers relationship. To know the importance of consumer’s credit scheme. To determine the present condition of consumers credit scheme at NCC. To identify the factors affecting in marketing of consumer credit scheme. To identify the problems those are arisen in implementation of consumer’s credit scheme. To find out ways to solve those problems. The report is composed of information collected from both secondary source and primary data collection survey. The primary information has been collected from the institutional and as well as some general clients of the bank. The secondary data collected from the National Credit and Commerce Bank archive, Annual report and used for the organization part of the report. Some opinions and ideas have been incorporated in this paper through interactive Sessions and interviews with the top management and mid level executives of the Organization. For primary data, I have conducted a survey of different respondents to collect the observations and analyze the data for evaluating the business development trend of the branch. Þ Information regarding new products development. As well a view of marketing analysis has been kept. We know that the marketing practices are the combination of 4p’s that means how a marketer manages this 4p’s. The 4p’s of marketing are product, price, place, promotion. So, the shade of the study has been analyzed on the basis of 4p’s. Þ Time was the most important limitation in preparation of the internship report. The program allotted only 3(three) months for entire study, which disable many opportunities for a comprehensive study. Þ Relevant papers and documents were not available sufficiently. Þ It was little difficult to get the actual information. In many causes the questionnaire had to be explained elaborately to the respondent. Much concerned was raised by the respondents such as, why the study is being undertaken, what would it reveal, are there any risk involved in answering this questions etc. Þ In many causes up to date information is not available. Þ As the officers were very busy with their daily work, they could provide very little time. Þ Due to time constraints the sample size for the survey is small. Þ The annual report does not contain some valuable information that is necessary to calculate some important ratio to see the bank performance. National Credit and Commerce Bank Ltd. bears a unique history of its own. The organization started its journey in the financial sector of the country as an investment company back in 1985. The aim of the company was to mobilize resources from within and invest them in such way so as to develop country’s Industrial and Trade Sector and playing a catalyst role in the formation of capital market as well. Its membership with the browse helped the company to a great extent in this regard. The company operated up to 1992 with 16 branches and thereafter with the permission of the Central Bank converted in to a full fledged private commercial Bank in 1993 with paid up capital of Tk. 39.00 corore to serve the nation from a broader platform. The Bank has set up a new standard in financing in the Industrial, Trade and Foreign exchange business. Its various deposit & credit products have also attracted the clients-both corporate and individuals who feel comfort in doing business with the Bank. To mobilize financial resources from within and abroad to contribute to Agricultures, Industry & Socio-economic development of the country and to pay a catalytic role in the formation of capital market. To share a significant portion of the banking sector’s by utilizing available manpower and also state of the art technology for maximizing the shareholders wealth. 1. Long-term goal: To maximize the wealth of the shareholders. 2. Short-term goal: To earn satisfactory rate of return on investment providing wide range of banking services. Þ Highly qualified and efficient professionals manage the bank. Þ National Credit and Commerce Bank Limited has established a core Research & Planning Division with efficient persons. Þ The bank has established correspondent relationship more than 100 of foreign banks. Þ The computerized operation system in all branches of NCCBL has provided the frequent and prompt customer service. Þ The strict leadership along with the supervision of efficient management directs all the branches. Þ The inner environment and teamwork of all branches in NCCBL motivated all experienced employees to achieve the ultimate objective of NCCBL. Þ National Credit and Commerce Bank Limited has become a member of the SWIFT system to expedite foreign trade transaction. Þ National Credit and Commerce Bank Limited has become introduced some scheme for the purpose of saving of low income people which are not available in other like “ Ajebon Pension Scheme”. Þ The bank offers attractive saving rate than other financial institutes. Þ National Credit and Commerce Bank Limited provides loan to the customers at lower interest with easy and flexible condition than the others do. Þ National Credit and Commerce Bank Limited charges lower commission from their customer in comparison wit other banks. Þ Along with the profit generation National Credit and Commerce Bank Limited also maintain social responsibilities. Þ The bank always guided their potential customer by giving valuable advises. At present the Board of directors consists of 14 members including the Chairman and Vice Chairman of the NCC Bank. Out of all members 14 of them are the sponsors of the shareholders. Most of the members are reputed industrialist and business persons of our country. The Chairman heads the Board. Each of the directors is the member of the Board. The particulars of the Board are presented as under. Marketing is a total system of business activities designed to plan ,price, promotion and distribution satisfying goods and services to present and potential customer. According to the official definition of the American Marketing Association Marketing is the performance of Business activities that direct the flow of goods and services from producer to customer or user. The concept of Bank Marketing has been defined by various Banks Marketing as that part of management activity that seeks to direct the flow of banking service profitability to selected customers. The adoption of the marketing concept will recognize that banks customer are changing in terms of their wants, needs, desires , expectations , and problems Banks must define these in explicit terms and them evaluate their offering in customer’s terms. That is satisfying customer’ needs at a profit to the Banks. Marketing mix is the mixture of controllable marketing variables that the firm uses to pursue the sought level of sales in the target market. We can say that the 4P’s are interrelated and must be blended into one integrate whole to satisfy some target market needs and performances. 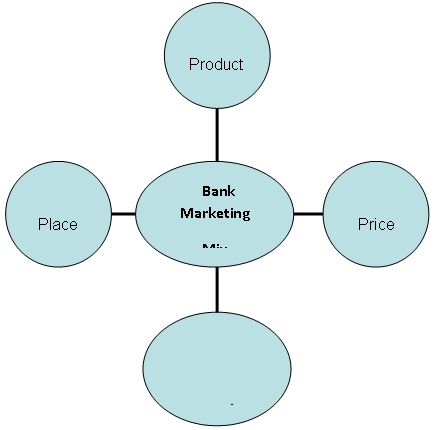 So , marketing mix is a set of product, price, promotion and place which are interrelate. The products of banks are essentially services. The products of Banks of are essentially services. Any satisfaction the customer gets form the performance of the service rather then forms the ownership of goods. Banks are in the Business of marketing cash security, cash accessibility, monetary transfers and time to enable customers wants to be satisfied to day without waiting until tomorrow when their own saving are higher. So, Banking product means services, which are able to satisfy the present and potential customer. For Join Stock Companies, Association, Clubs etc. Copy of the certificate of incorporation or registration. Copy of the certificate of business. True copy of memorandum of association and articles of association abide by laws. True copy of resolution of the board of directors / managing committee / governing body regarding conduct of the account. Certificate list containing the names and signature of the board of directors / officer bearers. The bank provides savings account services for the ease of its clients. It offers both personal and corporate Savings Account to its clients in every branch. The current rate on the deposit amount is 7% and the minimum balance requirement is TK. 1000.00. The bank requires no other service charges in opening this type of account. The closing charge for this account is TK. 100.00.
k) Initial deposit of Tk. 1000. It is also interest bearing depository service. The current rate for short-term deposit is 6% per annum. This is a fund generating service for bank with lower cost compared to other. Þ If the fund is insufficient. Þ If the payment is stopped by the drawer. Þ If payment is stopped by the court by issuing garnishee order. Þ Any competent authority issues attached order. Þ Check is presented after the death of the customer. Þ Check presented after the business/banking hour as declared earlier. Deposits are also accepted by the bank against acknowledgment in the form of receipts for the specified amount and fixed periods. They are known as term deposits receipts for the specified amount and fixed periods. They are known as term deposits attracting higher rates of interest graded on the basis of the periods of deposits. The longer the period, the higher is the rate of interst on them. The receipt are not negotiable and not transferable. Sometime encashment of a receipt before maturity is allowed upon surrender of the interest. Unlike the current and savings deposits no bank account is opened for these deposits in the names of depositors. It is also interest bearing depository service. 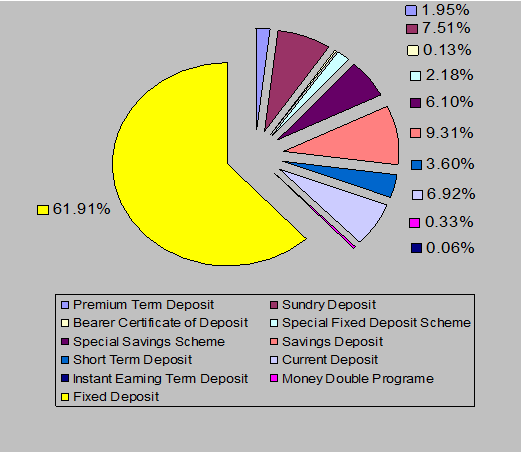 The current rate for premium-term deposit is 13% per annum. This is also interest bearing depository service. The current rate for premium-term deposit is 11% per annum. Name of the scheme is “NCC bank special savings scheme”. Two types of account can be opened under this scheme. One for term of 5 (Five) years and another for a term of 10 (ten) years. Rules for both the accounts shall be the same. Monthly installments of deposit will be Tk. 500/= and its multiple up to Tk. 10,000/= only as mentioned below to be deposited every month during the entire period of the scheme as fixed at the time of opening the account. Account may be opened for any installments but later on the same is not changeable. Þ Introduction may be waived but photograph will be required to open the A/C. Account in the name minor can also be opened. Þ A person is allowed to open more than one account for different installment in a branch/bank. Þ No withdrawal shall usually be allowed before 5 (five) years. If any account is needed to be closed before 5 (five) years, interest at prevailing rate on saving A/C shall be paid along with the principal. Þ No interest on the deposited amount shall be paid be paid if the A/C is close before 6 (six) months. In case of premature closure of any account Tk. 100 to be realized as account closing charge. Þ In case of withdrawal of money by closing the A/C after 5 (five) years (for 10 years term) full amount applicable for 5 (five) years term and interest at prevailing rate on saving A/C for the rest period along with principal shall be paid. Þ Monthly installment will have to be deposited by 10th day of each month (In case of holidays, deposit can be made on next working day). Advance installments are always acceptable. Þ In case of lapses in depositing installment, the deposit slip of that particular installment to be used with month wish unto date late fees @2% per month per installment (on due installment) mentioning in the respective column of deposit slip along with due installment to be deposited. Þ If an account holder fails to deposit 3 (three) consecutive installment before the expiry of 5 (five) years time the A/C shall be treated out of this scheme and interest at prevailing rate on savings A/C shall be paid. Þ Deposit book to be issued for the mentioned installment size and period at the time of account opening. Þ In case of mission of deposit book a sum of Tk. 100/= to be realized while issuing duplicate book but in that case, pages of installment so far paid earlier to be removed/cancelled from the duplicate book. Þ No pass book to be issued in favor of the account holder. Þ Under the scheme and account holder can instruct the bank to make payment of installment to the debit of his/her separate A/C with the branch. Þ Depositors may nominate one or more persons against the account as “Nominee”. In case of death of A/C holder, transaction in the A/C will be suspended and payment will be made to the nominee(s). If there is no nominee, payment will be made to made to the legal heirs of the deceased (depositor’s) against succession certificate. Þ In any Excise Duty/Income tax etc. is levied by the government on deposit/interest earned the same will be paid by debiting depositors accounts. Þ On completion of any term (5/10 years) payment shall be made after one month from the date of deposit of last installment. Þ Maximum up to 80% loan on deposit may allow to the A/C holder at ruling lending rate of the Bank. The clients can invest in different deposit rates for different maturities. The bank encourages its clients to invest in fixed deposit rate as it is one of the effective means of acquiring large amount of deposit from people. NFCD account can be opened for a term of 1 month, 3 months, 6 months and 12 months in USD, GBP, German Mark, Japanese Yen or EURO Currency with any of their AD branches. The minimum amount of deposit should be USD 1000.00 or GBP 500.00 or equivalent amount in other currency. NFCD account can be operated or renewal basis up to an unlimited period. The account holder can operate such account as long as he /she desires after the final return from abroad. A non-resident Bangladesh national can also open an NFCD account by deposit of foreign currency earned in foreign country within 6 months from the date of his/her final return from abroad. Interest will be accrued on the balances of foreign currency deposit in NFCD account at the equivalent rate of interest applicable on EURO currency deposits. Interest so earned on the NFCD balances will be tax-free. Balance of NFCD account in foreign currency can be remitted to any country freely. This balance is also convertible in BD Taka at the prevailing exchange rate. Persons ordinarily resident in Bangladesh may open and maintain with us Resident Foreign Currency Deposit (RFCD) accounts with foreign exchange brought in at the time of their return from travel abroad. Any amount brought in with declaration to custom authorities in form FMJ and up to us $ 5000 brought in without any declaration, can be credited to such accounts. However, proceeds of export of goods or services in Bangladesh or commission arising from business deals in Bangladesh shall not be credited to such accounts. Balances in these accounts shall be freely transferable abroad. Fund from these accounts may also be issued to account holders for the purpose of their foreign travels in the usual manner (i.e. with endorsement in Passport and Ticket up to USD 300/- in the form of Cash currency notes and the remained in the form of TC). These accounts may be opener in us Dollar, Pound, Staling, DM or Japanese Yen and may be maintained as long as the account holder’s desire. Interest in foreign exchange shall be payable on balances in such accounts. if the deposits are for a term of not less than one month and the balance is not less than USD 1000/- or $ 500/- or its equivalent. The rate of interest shall be 0.25 present less than the rate at which interest is paid on balance of back in their foreign currency clearing accounts maintained with the Bangladesh bank. 1) Savings Bank/Current Deposit/Fixed Deposit/ Special Deposit / Premium Term Deposit/Instant Earning Term Deposit/SSS/MDP/NFCD/RFCD/FC Account may be opened in the name of adult individual or jointly who is/are mentally sound. 2) Savings Bank Account may be opened in the name of Club, Association. Society and similar institutions. 5) Short Term Deposit Account may be opened in the name of Corporate Bodies. Joint Stock Companies. 6) A suitable introduction acceptable to the bank is required for opening bank account except Fixed Deposit Account. from CD, STD & all loan A/cs. signed with the specimen signature of the A/c holder (s) recorded with the bank. forfeiture of interest for that month. in such a way as to prevent the insertion of any other words or figures which may facilitate fraudulent alterations. will be recognised unless it bears the initial or signature of Bank’s officials. will be realised as per bank’s rule. any responsibility in case of delay or any loss. though drawn payale to bearer. supplied on request against payment of Tk 20.00 for each month’s statement. 18) If a depositor likes to close his/her/their A/c, service charge for Savings A/c. Tk.100.00 and for CD & STD A/c. Tk. 500.00 will be deduct from the A/c. reason which in its opinion is not satisfactorily conducted. 23) The Bank reserve to itself the right to alter or add to or cancel any of the forgoing rules at any time. NCC Bank has launched its Visa Credit Card Service on August 22, 2005 and we are offering three types of cards which are Visa Classic, Visa Gold (Local) and Visa Dual Currency Card (Globally and locally). Since then were able to reach 5000 cards, both corporate and general. NCC bank Visa Credit Card is accepted at over 5,000 merchant outlets around the country. Our wide range of merchants include Hotels, Restaurants, Airline and Travel Agents, Shopping Malls, Hospitals, Jewelry Shops, Mobile Phone and Internet Service Providers, Petrol Pumps and many more! Now NCC Bank Visa Credit Cards can also be used at all 142 ATM’s Booth and 600 POS (Point of Sale) of Dutch-Bangla Bank. Corporate is characteristic of individuals acting together; “a joint identity”; “the collective mind”; “the corporate good”. Reach Us National Credit and Commerce Bank Ltd. Correspondence arrangement with more than 330 Financial Institutions all over the World for Wage Earners Remittance we have Agency arrangement with 12 reputed Exchange Houses covering major Locations of our Expatriates. Using the services of these global network, non resident Bangladesh nationals can send money from abroad to their home country within a few minutes without any risk, Besides Money Gram, they have also arrangement with foreign money exchange companies like U.S.E. Exchange Co. Redha-al-Ansari Co. etc. through which Bangladeshi expatriates can remit these money to their relatives in home country very easily and safely using SWIFT network. MoneyGram and SWIFT mechanism ensure 100% secured and quickest possible mode of money transfers from abroad tour country and Bangladeshi money receivers are enjoying these facilities through us. NCC bank ltd. is rendering exceptional services to its clients by arranging such private remittance of money from foreign countries to Bangladesh. weighted average rate as of 31 December 2006. All exchange gains and losses are credited / charged to the profit and loss account. National credit and commerce bank limited is very happy to announce to have joined hands with MoneyGram payment systems Inc to serve expatriates to send money back home quickly from anywhere in the word. Moreover, money can also be sent quickly through MoneyGram from Bangladesh to other parts of the world as is done through the banking channel. At the moment they are concentrating on home remittances being sent by the expatriates. MoneyGram payment system Inc is a non-back provider of electronic money transfer service. MoneyGram is providing its customers a service of an unsurpassed quality and superior value. MoneyGram has over 25,000 agent locations throughout the world. Persons anywhere require transferring cash quickly, reliably, conveniently and at attractive prices to more than 170 countries can depends MoneyGram agents for the service. Finally using the MoneyGram service could not be simpler. All one has to do is to visit a conveniently situated MoneyGram agent anywhere in the world and hand over the money they want to send their relatives or friends along with the one-off transacting fee. Þ Sender completes a “Send” form and gets a receipt. MoneyGram agent gives a Ref. No. which has to be passed to the receiver. Þ Recipient the goes to NCC bank branch in Bangladesh. Fills out a “Receive” form and show proper identification. Þ NCC bank makers and inquiry on the MoneyGram computer network to obtain authorization to pay recipient and recipient receives the fund. MoneyGram is one of the fastest way to transfer money. Customers using MoneyGram can send or receive money usually within 10 minutes from anywhere in the world. At NCC bank they provide the recipients immediate attention ad due care. They have made it a point to pay the recipient within minutes. The recipients need not require having a bank account. They do not levy any extra charge. They give a better exchange rate to the recipient. The recipient can approach any for the NCC bank branches at his convenience for payment. Ø The sender gives receiver ‘(8) Eight Digit secret reference number’. Ø Receiver fills up the ‘Receive Form’ with all information real and correct with ‘(8) Eight Digit secret reference number’. Ø The sender gives receiver ‘(16) sixteen digit secret reference number’. Ø Receiver fills up the ‘Receive Form’ with all information real and correct with ‘(16) sixteen digit secret reference number’. Ø The sender gives receiver ‘(4-8) five digit secret reference number’. Ø Receiver fills up the ‘Receive Form’ with all information real and correct with ‘(4-8) five digit secret reference number’. Ø The sender gives receiver ‘(9) nine digit secret PIN number’. Ø Receiver fills up the ‘Receive Form’ with all information real and correct with ‘(9) nine digit secret PIN number’. Ø The sender gives receiver ‘(13) thirteen digit secret reference number’. Ø Receiver fills up the ‘Receive Form’ with all information real and correct with ‘(13) thirteen digit secret reference number’. Ø The sender gives receiver ‘(12) twelve digit secret reference number’. Ø Receiver fills up the ‘Receive Form’ with all information real and correct with ‘(12) twelve digit secret reference number’. Ø The sender gives receiver ‘(9) nine digit secret reference number’. Ø Receiver fills up the ‘Receive Form’ with all information real and correct with ‘(9) nine digit secret reference number’. Ø The foreign remittance officer receives the form and he checks the information given in the form by using the ‘Website Basis Software’ which has all the information of receiver. Ø He must have a commissioner certificate with attested photograph of him. or his passports photocopy 1st 5 pages as identification of himself for collect the remittance money. or he can collect a NCCBL card form the NCCBL for farther collect the remittance money. Ø If this information given there are correct than he print out the information page from the software and prepare the cash receipt with all formalities like attach a Govt. Stamp opposite side of the cash receipt. Ø The receiver must give (2) two signatures one is on the stamp and the other one is below the stamp. Ø Then the officer sends the receiver to the cash department with those vouchers to collect the remittance money. If he need cash money. Ø If he wants to transfer his remittance money in his account. If he has an account with the NCCBL than he can transfer his remittance money in his account. National credit and commerce bank limited is a member of the Society for Worldwide Inter bank Financial Telecommunication s.c.r.l. (in abbreviation S.W.I.F.T. s.c.r.l.). Through this fast, reliable and secure global communication NCC bank has gained 24 hours connectivity with over 7000 financial institution in 200 countries for transmission of LCs, Guarantees, funds transfers, Payments, etc. i) Member, Dhaka Stock Exchange Ltd.
ii) TT, DD, MT, PO service. There are four alternative planning product strategies. Offering more existing service to existing customer or client, is market penetration offering more service to existing customers. Offering more existing service to new client that is market development tries to attention new client. Development New service / products to existing customer what is service/ product development. Banks are following this strategy. Develop new service for new customer, that is, diversification. bank has more diversify products to new customer. Banking interest rate means banking price. Price is important since it represent the only element of marketing mix that creates revenue. The banking system doses not in fact price all its services. Since some are offered free to customer. The most important price in the Banking system relate to interest rates. The government controls basic interest rates. Banks provides various interests to deposits and receiving interest form rates. Tk. 100.00(Flat) per instance from the account of the depositor. iii) Tk. 500.00 half yearly on each loan account. The term production is used to refer of persuasive information which in conjunction with other elements of marketing mix, relates to the target market. The banks have to decide how information about the organization and its services will be disseminated. Four elements of the marketing communication mix generally recognized. As my study is concentrated with the existing marketing of product or service to offer customers. I have tried to compare its strategies, policies and effectiveness and measure the satisfaction level of customers with the NCC Bank Ltd.
To measure customers’ satisfaction is vary difficult. Because it is the applied research that always becomes different views from different clients. Now I present existing marketing of products and performance that shown in below with charts and figures following ways. Target market determination is very important factors for every business organization. In banking sector it is also very important to determine target market appropriately. To determine the target market, market should be divided into several segments. Then bank can choose one or more segment as their market the segment chosen by the NCC Bank Ltd as target market. Banking is a service based organization. So it is very difficult for the banks to identify and develop various, types of service. It is also difficult to identify the unexpressed / latent demand of clients. Also there is very intensive competition in banking service and it is increasing very rapidly. By observing the above table we understand that NCC Bank Limited (NCCBL) holds maximum service. But NCCBL does not provide innovative service. The interest rates on deposits are varies on time and bank to bank. The interest rates of the NCCBL are given below. NCCBL provides comparatively lower interest rate for FDR. Sometimes clients claim that other banks give high interest rate for the customers. From the chart we show that the amounts of deposit are gradually increasing from year to year. From the figure we have shown that interests on loans are comparatively higher than any other banks. So NCCBL should reschedule interest rates on loans for better customer service. Customers are separated from the bank. They are living in various in the country. So, to attract the customers, to serve them it is necessary to reach. Distribution channel should be such away that to achieved the benefits provides by the bank. Banking activities as a service it provides direct distribution channel. So, more branches indicate more efficiently in distribution. NCCBL holds 53 branches and considers factors to open the bank branch. NCCBL must consider not only urban area but also rural area for expanding banking service. For providing efficient cash services every bank has separate cash counters. They may provide cash services with one or more cash counters. I represent numbers of cash counters at Jatrabari Branch of NCCBL. From the table we see that Jatrabari Branch of NCCBL may expand payment and bill counters for quick and efficient service. 4.6 Promotional activities Promotional activities create awareness, interest, desired and action for banking services. It also helps to create their image positioning in customer mind. Now a day, for intensive competition every bank increases their promotional activities. Promotion becomes one of the most important activities in bank service marketing. There are four tools of promotion. Advertisement is the most uses promotional tools. In advertising various media are used. Media used by the NCCBL for advertising are given in the below table. Now a day, most of the banks use personal selling as promotional tool for their banking services, because personal selling is the most effective promotional activity for service marketing. It helps the banks for creating better image. Public relation activities of the NCCBL are given below chart. So the banks should increase their Public relation activities for create better-image. We also show some “social responsibilities” as public relation activities in appendix with picture. Sales promotion is another tool of promotional activities. As banking is a service base organization it perform a low amount of sales promotion activity. In table we see that the sales promotion activities are followed by NCCBL is low. These are the various strategies followed by the NCCBL in the Product, Price, Place and promotion sector. They use these strategies for designing some marketing strategies. The overall marketing strategies followed by the NCCBL are given below in chart. From the research I conducted, find out these strategies followed by the NCCBL to achieve their objectives through satisfying their customers. I also try to measure the satisfaction level of customers of the NCCBL. I try to see the existing marketing of products and the impact of these strategies on the customer of the NCCBL. That is why I find out major factors that determine the satisfaction level of the customer. Then I prepare the final questionnaire and serve 50 customers of the NCCBL. Though the number is limited but I try to find out the appropriate level of satisfaction. The customers of NCCBL give their opinion about the various factors of the bank services. Firstly I have found out the level of satisfaction of the respondents on various factors. I conducted my study with five scale questionnaire with a score of each scale. From the above measurement performance table, we examine that the performance of NCCBL is moderate. Thus NCCBL must improve particular segment of services. The recommendation explains the suggestions prepared by the report creator. Customers are the heart of the business organizations. But the main objective of an organization is to achieve profit. So, banking organizations like other business sectors are engaged in earning profits through customer satisfaction. So, all the strategies of banks are operated to satisfy the customers for earning profits. From the study / internship conducted, I find out the strategies and measure the satisfaction level of customers of National Credit and Commerce Bank Limited (NCCBL). From that study I find some recommendation for that bank to improve its customer’s satisfaction level and achieve their objective quickly. Þ NCCBL should provide some selected products. So, should increase their product category to attract the more customers. Þ NCCBL must redesign their interest rate to attract more customers. Þ NCCBL should provide 24 hours service. Þ NCCBL should serve more segments of customers as their target market to increase the numbers of present customers. Þ NCCBL should increase deposit facilities for long period of time. Þ NCCBL charges higher amount of transaction. So, NCCBL should decrease it. Þ NCCBL should increase the number of branches in rural areas. Þ NCCBL should increase their modern banking facilities. Þ NCCBL should increase the efficiency of cash counters and also increase the number cash counters. Þ NCCBL has very few foreign exchange branches. So, it should increase it. Þ NCCBL should develop their inanimate environment, employee dress up, up-to-date equipment, image and total system. Þ NCCBL should try to increase dependency, total system and hold the existing quality of the service factors. Þ To meet the intensive competition, NCCBL should be modernized and protect their position. Þ NCCBL should find out new markets to capturing more customers. Þ NCCBL should increase the research activities to find out the lacking and to provide better services for better customer satisfaction. Þ NCCBL should take active participation in social functions and infrastructure development to develop the economy of country. Þ NCCBL must provide online Banking service as early as possible for sustaining its business. Banking service is the most important field of economy’s that make the economy strong, dynamic and develop the life style of citizens. In the banking sector of Bangladesh, NCCBL is well established leading bank. So, from the research I find out the movement and future vision of banking sector of Bangladesh. From the research 1 also find out the marketing strategies followed by the NCCBL and measure the satisfaction level of customers of that bank. I also find out the lacking of the NCCBL for which customers are not completely satisfied. I have recommended some possible solutions to overcome the lacking and to satisfy the customers completely. I think banks can overcome their all problems lacking to develop the customer satisfaction level and thus they can lake more important value in developing the total economy of Bangladesh.